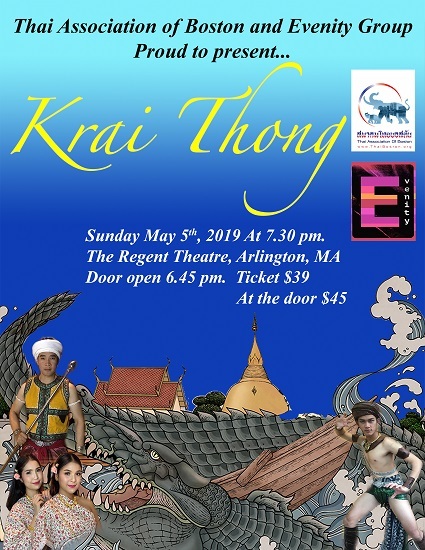 You will be treated to a night of elegant Thai cultural performances, proudly presented by performers from Thailand and New England! Krai Thong is a folktale originated in Thailand from Phichit Province. It tells the story of Chalawan, a crocodile lord who abducts a daughter of a wealthy Phichit man, and Kraithong, a merchant from Nonthaburi who seeks to kill Chalawan. The story was adapted into a play, credited to King Rama II (r. 1809–1824), and has seen various modern adaptations. Krai Thong is a real figure, however he has no magical power like in the story. He was from Nonthaburi and worked as a merchant and a crocodile hunter. After the locals from Nonthaburi Province heard about Krai Thong’s heroism, they established a temple for his courageous act. The temple is called Wat Bang Krai Nai, located near the area of Krai Thong’s old village. The story also reflects how Thai people in old times had a strong relationship with animals. They believed that crocodiles and humans can have relationships and crocodiles do have feelings like humans.